If you’ve ever tried to smoke meat on a standard kettle grill like the Weber Kettle, you’ll know that it takes a little tinkering with to get it to do what you want it to. 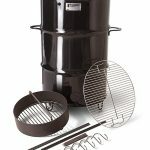 There’s the two zone set up that we described in our best charcoal grill post that uses water pans and a clever configuration to create a very basic smoker. This works fine but can be finicky and difficult to control. What you need is a product that takes all the hassle out of the process and produces brilliant food with little to no effort. That product is of course the Slow ‘N Sear by Adrenaline Barbecue Company. But does it work as well as advertised and is it worth your money? Read the rest of our Slow ‘N Sear review to find out. 1.1 What is the Slow ‘N Sear? 1.2 How Well does the Slow ‘N Sear Work? 1.6 What Grills does the Slow ‘N Sear Work with? What is the Slow ‘N Sear? The Slow ‘N Sear is a simple accessory that sits inside your 22 inch kettle grill and creates a boundary to give you two distinct cooking areas. 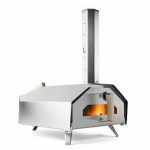 It uses a water reservoir to split the cooking area of your grill into a super hot sear zone and a convection oven/smoker zone. To sear with the Slow ‘N Sear is very simple, you load it up with charcoal, light it and when you’ve got a nice hot grill start searing away. To smoke with the Slow ‘N Sear is surprisingly just as simple. Start by lighting a bit of charcoal in the corner of the Slow ‘N Sear and when that catches fill the entire thing. Then place your meat on the other side, in the newly formed smoker zone of your grill. Make sure the vent of the lid is placed above your meat and is partly open. Hook up your thermometers and you’re ready to go. How Well does the Slow ‘N Sear Work? In short, it works very well. We’ll start with the searing half. To be able to sear a steak to perfection you need very high temperatures. How the Slow ‘N Sear achieves this is that it confines and raises hot charcoals to right underneath the grate to create very high temperatures. A very simple solution that works well. Could you replicate the results without the Slow ‘N Sear? Probably. It’s a nice addition to the overall package and does make searing generally better and easier but this probably isn’t the reason you’d buy one. 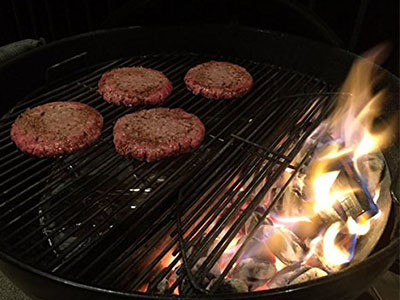 We think the best searing experience comes from dedicated infrared grills but there is something unique about searing over coals and the Slow ‘N Sear does it well. Where the Slow ‘N Sear really shines is the ability to make your kettle grill cook low and slow. Using the water reservoir and the charcoal basket, the Slow ‘N Sear creates a very stable cooking environment that can maintain consistent temperatures for hours on end. The perfect conditions for true low and slow cooking. The water also helps to keep the inside of the grill at a steady moisture level to ensure that you get soft, moist meat with a good smoke flavor. 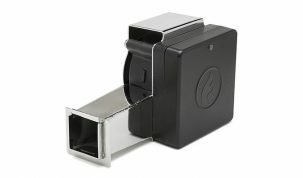 If you set your vents to the right levels the Slow ‘N Sear can cook for 8 or more hours on a single basket of charcoal. 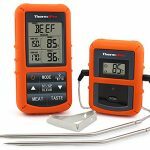 It is incredibly efficient and makes smoking meat exceptionally easy. 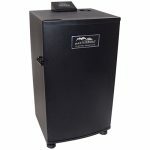 Check out our rundown of the best type of charcoal to use to get maximum efficiency and save yourself some hassle and money. 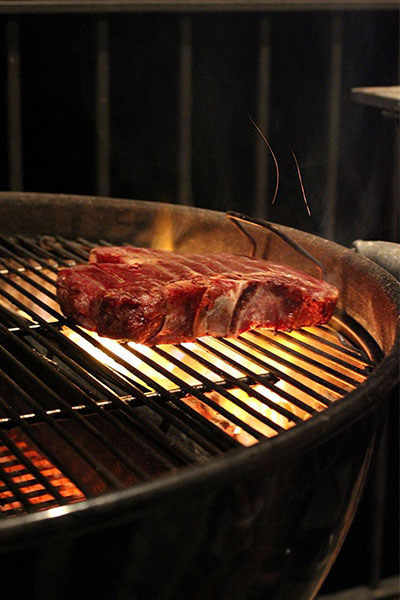 The Slow ‘N Sear is made entirely out of 304 grade stainless steel. It feels solid and is quite heavy at almost 6 lbs. It’s very well crafted and doesn’t feel cheap, even having its name etched into the curved surface. Whilst we haven’t been able to use the Slow ‘N Sear for very long we’d confidently bet that this would last years. The design is very simple but very effective. It looks nice out of the box, with a good finish and a satisfying fit in the grill. 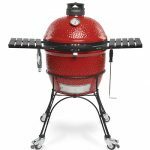 Not much else to say about the build quality and design, except that we don’t see how the guys at abcbarbecue could possibly improve on it. Except maybe the changes they made for the Slow ‘N Sear Plus. (We’ll get to that). Actually using the Slow ‘N Sear is about as easy as it gets. It perfectly fits in the grill, adding water can be done blindfolded and starting the coals is something that I’m sure you’ve done many times before. 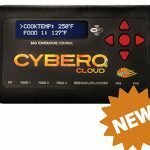 During the smoking process there might be a few minor adjustment needed to keep the temperatures at their desired level, but having the confidence that there won’t be additional coals needed because of the incredible efficiency improve ease of use tremendously. 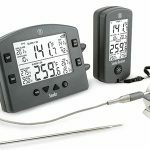 Just use a smoker thermometer and you’ll be fine. Comparing this to smoking on a bare kettle grill, this makes every stage of the process drastically easier. One small problem with the standard Slow ‘N Sear is that cleaning up the ash can be a little awkward. Luckily this problem is solved with the Slow ‘N Sear Plus. 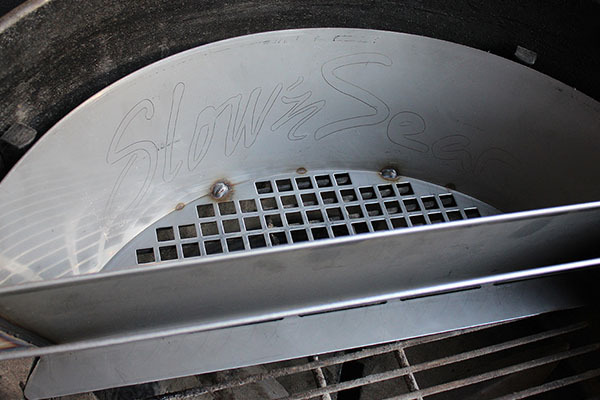 The Slow ‘N Sear Plus is just like the standard model expect it has a base plate welded to the bottom. 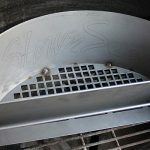 This base plate keeps the coals securely in the basket and allows the entire Slow ‘N Sear Plus and coals to be moved around the grill. This can be done before being lit or even when the coals are alight. We’d obviously recommend a set of heat resistant gloves if you’re planning on the latter. What the base plate also does, it makes clearing up the ash and unused charcoal much easier than the basic Slow ‘N Sear. You can now simply pick up the whole thing and dispose of the ash or re-use any charcoal you want. There is also a small extension on the base plate beyond the water reservoir that is used for extra stability. 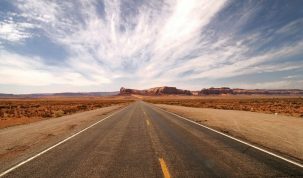 Stability was never a problem for us when we used it, but Adrenaline Barbecue Company thought it was enough of an issue to fix it, which is nice. There is also a Slow ‘N Sear XL for 26 inch Weber Kettles. It does the exact same job but is a bit bigger. 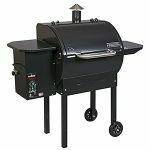 What Grills does the Slow ‘N Sear Work with? The Slow ‘N Sear and the Slow ‘N Sear Plus both work with all Weber Kettles including: Original, One Touch, Silver/Gold, Master Tough and all Performers. They also work with a rand of Napoleon kettles: NK22CK-L, PRO22K-LEG, PRO22K-CART-2. If you’re looking for the easiest way to turn your kettle grill into a great smoker then we’d highly recommend any version of the Slow ‘N Sear, with our favorite being the Slow ‘N Sear Plus. It’s very simple to use, is made tremendously well and works like a charm. The ability to easily and successfully sear is a great bonus but shouldn’t be the reason you buy one. The only problem we find with it is the price. For the cost of the Slow ‘N Sear Plus you can buy a basic 22 inch Weber kettle and have enough change left over to purchase several cooks worth of charcoal. 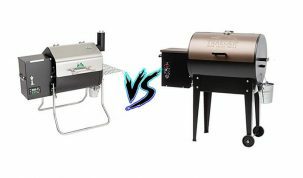 However, if you compare the Slow ‘N Sear Plus and a 22 inch Weber Kettle to the price of a Weber Smokey Mountain then things start to make more sense. It is definitely cheaper to buy a Weber Kettle and the Slow ‘N Sear Plus than it is to buy a Weber Smokey Mountain. You also get the added benefit of being able to grill and sear on the Weber Kettle, whereas this isn’t possible on the Smokey Mountain. So, despite the relatively high cost of the Slow ‘N Sear, would we still recommend it? 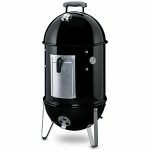 The ability to convert a kettle grill that you may already own into a proper smoker with the additional ability of quality searing is well worth the price. If the Plus is a bit more than you’re willing to spend and you’re looking to save a bit extra cash then the standard Slow ‘N Sear is the way to go. If you want the best Slow ‘N Sear possible, then get the Plus. Check the latest price of the Slow ‘N Sear on Amazon. 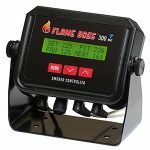 Check the latest price of the Slow ‘N Sear Plus on Amazon.